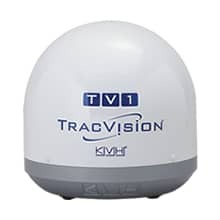 With its 32 cm (12.5-inch) antenna, the TracVision TV1 marine satellite television system is ideal for smaller boats and coastal cruising or use on inland waterways. An easy-to-use installation wizard and single-cable design make this antenna perfect for fast installations or retrofits. TracVision TV1’s sleek, IP-enabled TV-Hub is the belowdecks powerhouse that makes this advanced system simple to use. The TV-Hub enables a friendly user interface that you can access from any mobile device or laptop, providing system information at your fingertips. Bring the DVB-S2 compatible TracVision TV1 onboard today and start enjoying favorite programming from DIRECTV®, DISH Network®, Bell TV, and select linear Ku-band regional services worldwide.